Roller derby in ESPN The Magazine!! Yes! Check out this awesome photo gallery from the Running of the Bulls event in July, courtesy of photographer Ryan Hodgson-Rigsbee. 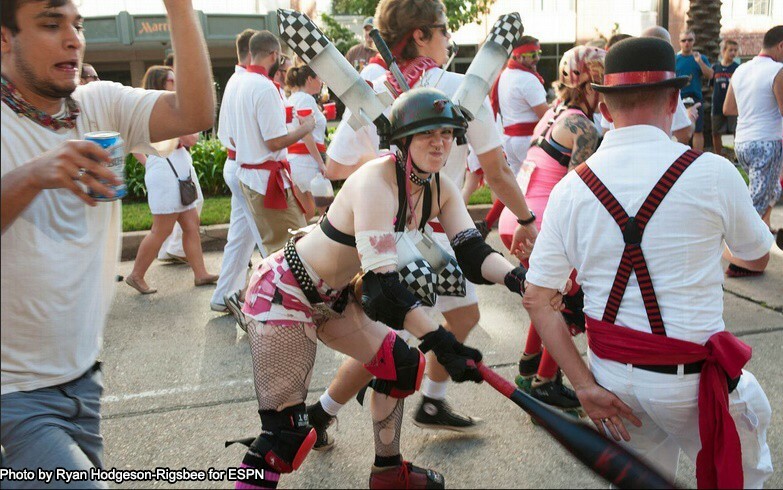 Of course, your Cajun Rollergirls and many of our friends are represented in this pictorial. You can see Star-Ree Eyed Surprize, Selena D. Crash, Cat O’Lust and Bust-Her Ballz in the first photo, and there are great pics of Delirium Trigger in action, and Trigger and DJ-TJ working on Trigger’s amazing, Horniest Bull-winning costume! Print copies of the magazine – which dedicated this edition to New Orleans and its recovery a decade removed from Hurricane Katrina – will be available on Friday, so get yours! Cajun Rollergirls make the cover of The Courier & The Daily Comet! It’s raffle time again!